Dabrowski’s Mazurka became the Polish national anthem over 90 years ago. But competition for that honoured title was tough, and each of the songs that just missed out has an interesting story of their own. The origins of this song are unknown but it’s most likely an original one (not a translation or interpretation) and was composed in the beginning of the 14th century. What goes beyond doubt is that Jan Długosz, the Polish medieval chronicler, mentioned it in his Annales Seu Cronici Incliti Regni Poloniae (known as The Annals of Jan Długosz). His writings indicate that Bogurodzica’s status was similar to the present concept of a national anthem. Not only did he refer to it as a patrium carmen (fathers’ song) but also notes that Polish knights sang it before the epic Battle of Grunwald and that later it became a part of coronation ceremonies. It is a religious poem, a prayer to the Virgin Mary and Jesus Christ, and a plea for enlightenment, a good, pious life, and salvation. The second verse is also interpreted as an invocation of parousia – the second coming of Christ. The language of Bogurodzica is very archaic, as it was even at the time of the song’s peak popularity. Even though Bogurodzica’s popularity as the quasi-anthem declined in the 17th century, it remains a very important relic of Polish culture and was reassessed by some of the most renowned artists of the 20th century. For example, Andrzej Panufnik used it as the basis of his Sinfonia Sacra, written for the millennial anniversary of Poland’s Baptism (and of the Polish state). The attached version is a reinterpretation of the song by Wojciech Kilar, one of the most eminent Polish composers of the 20th century. Even though this song was written during the 1820s, it didn’t reach its peak popularity until the January Uprising in 1863, an unsuccessful insurrection against occupation by the Russian Empire. A curious thing about it is that the final verse, which originally was ‘Save, Oh Lord, our King’, at that time referred to Russian tsar Alexander I, who held the title of the King of Poland, and in whom the author saw a possible ally in partial liberation from the occupation laws. However, with the authors’ hopes dying out, the lyrics evolved to ‘Return us Oh Lord, our free Fatherland’. Even more surprisingly, after Poland regained its independence the evolution went even further and it turned into ‘Bless, Oh Lord, our free Fatherland’. Thus, a very solemn, patriotic and religious song was sung, and still is being sung, in different versions depending on Poland’s political situation. Yes, we do have our own version of La Marseillaise. After hearing the news of the outbreak of the November Uprising in 1830, French poet Casimir Delavigne wrote a poem titled La Varsovienne. A leaflet with it was smuggled into occupied Poland, and there, translated into Polish. The director of the Warsaw Opera House, Karol Kurpiński, transformed it into a song. Its chances of becoming the national anthem were rather scanty, given the already established competition, but it is still very popular. It is often taught to children at schools… which might be quite surprising as its lyrics are no less bloody than those of La Marseillaise. The White Eagle launches into flight. In 1901, children from the Polish town of Września, at that time under German occupation, refused to answer in German during their classes. A seemingly small incident was to ignite one of the most famous protests against the Germanisation of Polish children and passed down in history as the Września children’s strike. Its repercussions were outrageous. Not only were the children beaten at school for not complying with their German teachers’ orders but everyone involved (both children and parents) were brought to court and sentenced to up to 2 and a half years in prison. The social resonance of this event was huge and the strike attracted international attention. Polish artists joined the movement. Ignacy Paderewski, a famous pianist and composer, publicly declared that all the income from his German tour would be donated to the Września activists. It caused huge indignation among Germans, who eventually boycotted the tour, thus giving the cause even more publicity. We won't let our speech be buried. We won't let the enemy oppress us. 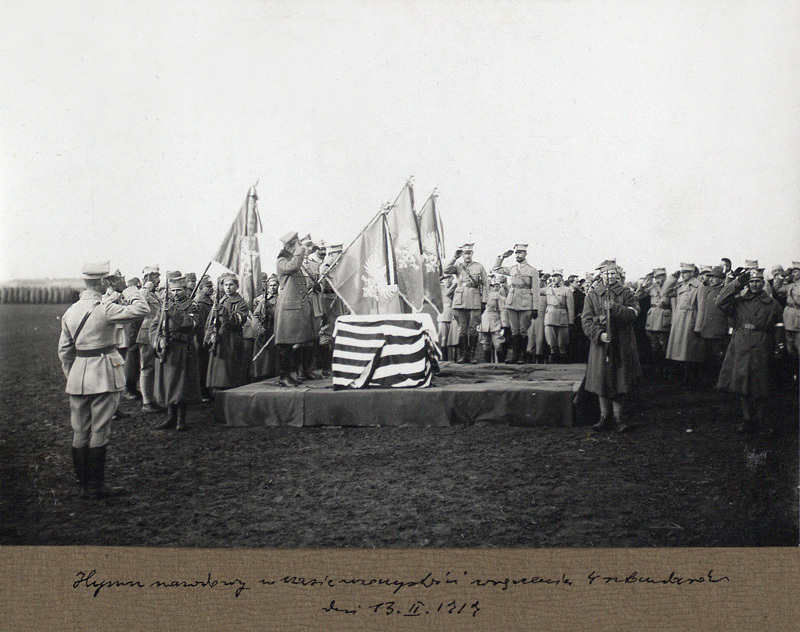 In subsequent years, the song was used as an anthem at most gatherings of Polish independence activists and remained very popular among Polish soldiers who fought during World War I. Thus, it was proposed as the national anthem a few times but eventually lost to Dabrowski’s Mazurka. What was he doing in Italy? Why did he write this song? Who was he? Let’s start at the beginning. In 1795 Poland lost its independence after being simultaneously invaded by its three hostile neighbours: the Russian Empire, Austria, and Prussia. Following the old rule that ‘the enemy of my enemy is my friend’, Polish soldiers decided to join the forces of a French general – Napoleon Bonaparte. Józef Wybicki, a great intellectual, poet, composer, diplomat, and political activist, went to Italy to help form Polish units, later to be named the Polish Legions, at the side of Bonaparte’s army. One day the growing army was celebrating the retirement of a few of its oldest soldiers and Wybicki wrote a song for the occasion. The soldiers seem to like your song more every day. We are humming it often too, with all the due respect to the author. After another few weeks, the song made it to Poland and immediately started spreading among Poles who dreamt about regaining independence one day. Its rise in popularity was so unstoppable that not only did it become Polish soldiers' dearest song of the entire campaign, but also gained anthem-like status. As much as the eventual fiasco of Napoleon’s invasion of Russia pulled the rug from under Poland’s dreams of independence, even the most brutal repression following it didn’t stop people from singing the song. Dąbrowski’s Mazurka became such a strong symbol of the Polish struggle to re-establish their country that it survived the whole turbulent 19th century and was one of the songs proposed for the national anthem after Poland was reinstated in 1918. However, the situation was far from clear and Polish official diplomatic representatives across the world were using different songs – usually one of those described above. People believed that the constitution established in 1921 would sort this mess out out, but it didn’t happen. Deliberations, seemingly prolonging into eternity, were terminated by the Ministry of Education, which single-handedly decided to put an end to this story and added the song to primary school curricula with a note ‘to be taught as the national anthem’, in 1926. In the wake of this move, the Ministry of Internal Affairs, not wanting to escalate the havoc, had little to do and legally acknowledged Dabrowski’s Mazurka status as the national anthem in 1927. If you want to know more about the Polish national anthem and the mystery behind it, click on the video below.